Can a recipe be cooked twice, and still be easy? Yes. Yes it can. Is it a cliche to set up your article with an easy-softball question designed to hook your readers? Yes. Yes it is. In a world where many of us complain that we lack the time to cook even once a day, it can be challenging to sell the idea of cooking a single recipe twice. But before you navigate away, let me assure you of two things: all of the cooking being done in this recipe is easy-peasy (and largely hands-off), and that anything that amazing things happen when you cook something twice. Just think of all the amazing meals that are cooked twice! The best french fries are cooked at least twice. The same goes for pretzels and bagels, which are boiled before being baked. Twice-baked potato? It’s right there in the name. And the Chinese classic Dongpo Rou (red-cooked pork belly, which is one of my all-time favourites) is boiled, then braised uncovered, then covered and slow-cooked to finish. Every one of these is incredible when it’s cooked correctly – and frankly pretty forgettable when shortcuts are taken. But that’s just the thing – if a recipe calls for two cooking methods, there must be a good reason. We’re all busy people, and we all love a good shortcut that works. But sometimes they just don’t cut it, sacrificing flavour and quality for convenience or simplicity. Making a really great french fry takes more time and effort. There are shortcuts of course, but the end result just isn’t as good, no matter how you slice it (pun intended). After all, if there truly was a perfect, fool-proof french fry that only needed to be cooked once, you can bet that every burger joint on the planet would be making them. There are plenty of carnitas recipes out there. Many of them are good, and many of them are … ehhhhhh. This is (if I do say so myself) a great and simple carnitas recipe that’s big on flavour. But it’s the second round of cooking that really makes this stand out, transforming the recipe from tasty pulled pork to an incredible, textural, cheesy-crispy-savoury delight. The idea is simple enough – you take the soft, succulent cooked pork and finish it in a frying pan along with a handful of cheese. The meat browns, the cheese ends up golden and crispy, and the flavours are all amplified wonderfully. I came across the basic idea for finishing shredded pork like this while reading about tacos de castacan on Serious Eats. That recipe differs quite a bit from this one (especially since it uses pork belly), but I was immediately intrigued by the pan-searing step. I’ve often felt that many recipes for carnitas or pulled pork are missing that little extra something (more on that below), so I decided to give the technique a try here. As good as the pork is on it’s own, I don’t think I could ever go back to making this without the crispy pan-frying stage. Sure, you could just take a bit of cooked pork and put it into a taco with some cheese, but the end result would be completely different, and you’d be missing out on something incredible. Just a little bit of hands on time at the griddle or frying pan crisps and browns the cooked pork and then, best of all, melts and browns the melty Oaxaca or asadero cheese, yielding little ‘pucks’ that are perfect for tossing right into waiting tortillas. Not only does it taste amazing, and the added cooking time is a tiny trade-off given the end result. Plus, because I’ve adapted this recipe for an Instant Pot electric slow cooker, the first part of the recipe is about as simple and hands-off as you can get. As an added bonus, this is an absolutely ideal left-over meal – refrigerated or frozen portions simply need to go into a hot pan with some shredded cheese, instantly transforming them into a new meal. This makes it fantastic for company too. Simply prep the pork ahead of time before quickly finishing it off and serving it at its best and crispiest, much to the admiration of your assembled guests. If you’re not a big cheese fan, you’ll still find that there are clear benefits to finishing the carnitas in a frying pan with a little fat. As I mentioned above, a lot of English-language carnitas recipes can be a bit flat or boring, and I think it has to do with the simplified liquid-cooking methods that are generally employed. Traditional carnitas from Michoacán are made by frying pork in fat, with the other flavours (spices, citrus, etc) generally being added in later in the cooking process. This frying method browns the meat more and yields lots of delicious crispy bits – aspects that you lose out on by using a pressure cooker or slow cooker (see what I mean about trade-offs?). By returning the meat to the pan, you brown and caramelize the meat, adding loads of depth and flavour. It’s not exactly the same as the crispy (and simple) traditional Michoacán version, but it’s a fantastic hands-off hybrid method that’s also lower in fat. The instructions below are for the Instant Pot electric pressure cooker, but this can easily be adapted to other cooking methods. It can be made easily in a stove-top pressure cooker by bringing it up to pressure over high heat, then reducing it to medium heat and cooking for about 50 minutes before allowing the pressure to release naturally. I covered a fair bit of the raison d’être for this recipe and the techniques used in it above, but I’ll still cover a few tips, tricks, and variations here. Rest assured though, it’s a wonderfully easy recipe to put together. I designed this recipe with the Instant Pot electric pressure cooker in mind, but it can be adapted to a number of other cooking media as well. Other electric pressure cookers can be used in very much the same way, with similar cooking times. You can also prepare this in a stovetop pressure cooker by bringing the ingredients up to pressure over high heat, then reducing to medium heat and cooking for about 50 minutes. The meal can be prepared in a slow cooker as well. Follow the instructions for the Instant Pot, placing everything in a slow cooker over low heat for 10 hours instead. Lastly, you can prepare this in a low oven (about 300°F/150°C) by simmering in a heavy, covered pot or casserole for 3-4 hours, or until the meat is tender. You may need to add a bit of water periodically to the pot in order to keep things from scorching. Regardless of the method, you can check for the doneness of the meat by seeing how easily it shreds. If it’s still a bit tough, cook it a little longer. As mentioned above, the way this recipe is finished is perhaps the most important part. I won’t go over the actual technique here again (it’s mentioned above and in the actual recipe below), but I will reiterate that it really transforms the character of the recipe, bringing fantastic flavours and textures to the forefront. It’s also a great way to make this a ‘meal on demand’ – frozen or refrigerated portions can be transformed into new and fresh meals with ease. As for toppings, you can of course go in any direction you like. Chopped raw white onion is a classic taco topping and particularly well-suited to bolder meat dishes like this. I love cilantro and use it liberally here, but you could substitute any leafy green if you’re among the cilantro-averse. I specify Oaxaca or asadero cheeses in the recipe because of their authentic flavour and melty/stretchy texture, which is ideal for this style of cooking. If you can’t find either of them, a good mozzarella will work in their place. Lastly, I’ll mention the salsa shown in the photos. In many ways, a good taco is made or broken by the salsa. It’s the punctuation on the sentence. Smoky dried chili salsa (k’uut bi ik) is an exclamation point. My recipe for this simple condiment is fiery (but not rip-your-mouth-off hot), with a smoky character that comes from added morita chipotle chilies. It’s also easy to make, and keeps for a very long time in the fridge. Plus, charred garlic. Charred garlic is amazing. You can find the recipe here. If you want to go in a different direction, I’d recommend a good, somewhat spicy cooked red salsa or salsa verde. As much as I adore pico de gallo, I think that a thinner, hotter sauce works best in this recipe. But hey, make it your own. Nutritional info is shown for a 2 taco serving, generously filled, with toppings and two corn tortillas. GOOD NEWS:High in protein, nutrient-dense, and low in sodium. BAD NEWS:The saturated fat content is a little high (which is to be expected in a meat-and-cheese meal), but I would expect that the actual numbers are somewhat lower as some of the pork fat will render out and remain in the cooking liquid. TRIM IT DOWN:Make sure you trim the pork shoulder well. You want succulent pork, but you don’t want it swimming in fat. Don’t go overboard on the cheese either – you want to use enough to get a nice crispy melt going on, but not so much that you’re completely burying the meat. Corn tortillas are what I prefer in this recipe, and they are leaner than flour, so keep that in mind. If you want to go a bit leaner still, fry up some peppers and onions with a bit of the cooking liquid and use these as an additional filling to go along with the meat. Deliciously tender Mexican pork, finished with crispy, bubbly cheese. The 'Con Queso' part involves a griddle or frying pan, but all the hard work necessary to get deliciously soft and succulent meat is handled by the electric pressure cooker, making this a perfect meal for a weeknight, or for entertaining. Trim the excess fat from the pork shoulder and cut it into 5 cm (~2.5 inch) square pieces. Place the pork in a bowl and toss to combine with the oregano, cumin, and salt. Place the pork and all the remaining carnitas ingredients into an Instant Pot or other electric pressure cooker. Seal and cook on the manual (high-pressure) setting for 60 minutes. Allow the pressure to release naturally (which should take about 15 minutes). Shred the pork and place it in a large bowl or other container. You can proceed directly to serving or refrigerate the meat until you're ready to use it. Pre-heat a pan or griddle on the stovetop. Add a small amount of shredded pork (about 2 tbsp at a time). Add a pinch of salt and sear in the hot pan for a minute or so, gently 'tossing' the pile to brown it all over. Once the meat is getting a bit crispy, sprinkle some cheese over the little pile of shredded pork. Let the cheese melt into the meat and brown in the pan. Once the cheese is crispy (but not burnt! ), flip the pile and lightly brown the other side. It should hold together fairly well thanks to the cheese. Use a spatula to remove the crispy cheese and pork bundles from the pan, setting them aside to cool a bit. Repeat with as much meat and cheese as necessary given the number of people you're serving. (Note: there should be enough fat in the pork and cooking liquid to keep the meat from sticking while you're searing it, but you could always add a little oil, lard, or bacon fat to the pan to keep things a little more non-stick). 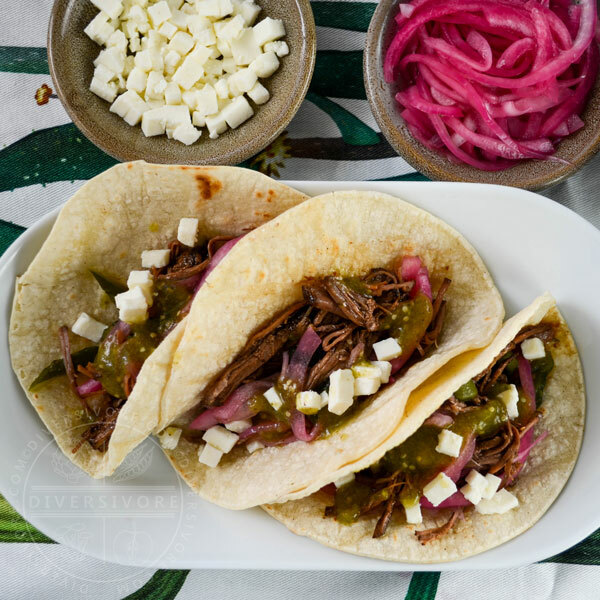 Serve tacos with a few bundles of cheese and meat, then top with onion, cilantro, white onion, salsa (see recipe link below) and/or any other toppings you like. The smoky dried chili salsa mentioned in this recipe and shown in the photos is wonderfully simple to prepare, and it provide bright and bold heat that works perfectly with this recipe. You can find the recipe here on Diversivore. This makes a pretty big batch of tacos, so you can consider halving the recipe, though it won't save you much in the way of time. I recommend cooking the full recipe and freezing any leftover meat (i.e. straight from the Instant Pot and before adding any cheese) in small batches. Simply reheat what you need and finish it in the frying pan with shredded cheese for a quick and delicious meal any time. For some reason, I’m extra hungry today. (I’ve had breakfast, had a snack, and I’m already pining for lunchtime. WHYYY.) Visiting this post is not helping my situation. I’m really intrigued at the idea of trying this with jackfruit, since I don’t eat pork. Do you think that could work? I love the flavors here! I’ve been thinking a lot about the non-meat alternatives myself Dana. Mexican cooking so often features some kind of meat (frequently pork, but with quite a bit of chicken and beef too). It’s not that there aren’t good seafood and/or vegetarian recipes – it’s just that they tend to be their own things, and somewhat removed from some of these meaty classics. Jackfruit would probably make a decent replacement here, though it would take some tweaking to get flavours right. Fresh jackfruit would probably work best, but the canned stuff tends to have a bit of briny acidity to it that you’d have to counter-balance in the recipe itself – probably by using a bit less orange juice, and possibly some added vegetable stock instead. You’d also want to finish the jackfruit version on a griddle with a bit of added fat (avocado oil, for example), as there’d be very little natural fat in the carnitas (vegitas?) itself. Hope that helps Dana! If you do give it a shot, I hope you’ll let me know how it turns out! We are huge taco fans in our house! And pork carnitas are a popular choice! I’ve never tried pan searing but I may try that next time. I usually just broil the pork after slow cooking it. Also happy this is an instant pot recipe because I’m obsessed with trying lots of different recipes in my instant pot! Thanks for sharing! Broiling the pork is a nice touch too. Honestly, anything that adds some of that great, caramelizing, Maillard reaction crispiness. As much as I love my Instant Pot, I feel that you really need that extra step here. Then again, one of the nicest things about the Instant Pot is the way you can brown in the pressure cooker, so you can bring a lot of flavour to stews (etc.) that way. Hope you enjoy the recipe – and definitely try out the pan-sear-plus-cheese method. It’s amazing! Cheers. You’re really persuading me to jump on the Instant Pot train with this beautiful recipe and all these delicious flavours! Admittedly I don’t experiment much with pork, but I think I would really enjoy it in this preparation. I love all the citrus and spice you have going on here. As always, I come away from Diversivore smarter than I arrived. Another masterpiece, Sean! I genuinely love the Instant Pot, but good recipes make a world of difference. The best thing about it is how simple and foolproof it is, plus the extended functionality of it (as I mentioned in a comment above the ability to sear in the pot is one of the nicest touches). But it’s easy to get caught in the trap of just making stews and soups over and over again. I think you’d love an Instant Pot, but if you do get one, I really recommend that you explore all of the wonderful and variable things you can do with one. It’s especially nice for staples like homemade stock and cooking beans, but there are honestly tons of ideas and options. Glad you enjoyed the recipe Justine. As always, so glad to have you here! These look deadly good, Sean! They’re definitely a favourite in our home…well, tacos in general! We plan on having fish tacos tonight, but will have to give these a go next time 🙂 Beautiful photos too. Happy Friday to ya! I tried carnitas for the first time at a resort in Mexico last year, and it was so dry and bland. Yours looks exceptional though! It’s true that so many of the tastiest dishes require a lot of work. It’s actually kind of sad that so many of us shy away from this kind of cooking in favour of whatever is quick and easy. Obviously, this isn’t a weeknight meal for most people, but it’s nice to make something special every once in a while!